Values, Beliefs and Politics: The Changing Tide of POR about Guns in the U.S. | Jenkins Research Inc. The most recent shootings in a Colorado movie theatre by a man armed with an automatic weapon has hardly caused a ripple in terms of public demands for gun control. In one way, this is strikingly surprising because we expect dramatic events such of this to focus public opinion on the negative consequences of gun freedom. We might predict that the appetite for gun control would evaporate but an initial reaction would make sense. The problem is that despite the regular appearance of such coalescing events, public opinion has been moving more and more towards opposing gun control options in the United States. Americans have become more likely to oppose gun control over time even as they have become more urban, more connected, and more exposed to the social risks of unfettered access to firearms. Lawrence Martin argues (“America has surrendered to the NRA”) that the NRA has won the political battle such that even the democrats are not talking about gun control. While there is no question that the NRA is very powerful, both in terms of its financial resources and its access to media, is the political power of the NRA sufficient to prevent stricter gun laws? The evolution of public opinion suggests it is not a naked exercise of power. More and more Americans are opposed to stricter laws. 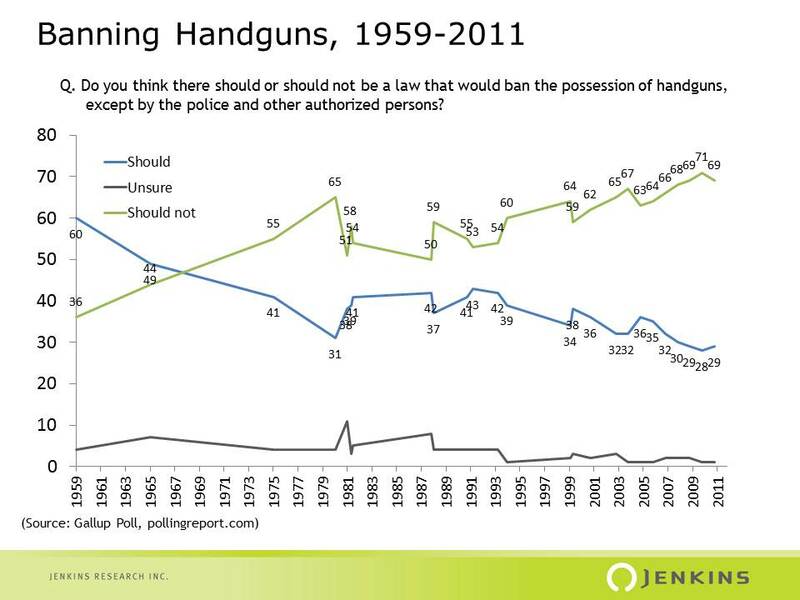 Since the early 90s, Gallup has found that the proportion of Americans who say that there should be a ban on the possession of handguns has declined from the low 40s to only the high 20s. Opponents now outnumber supporters of handgun bans by more than 2:1. Handgun bans are a good indicator of how people are thinking about gun control because they are implicitly about the balance between crime and personal safety/ self-defence. Other data point to more dramatic changes in opinion that have occurred more recently. But these dramatic changes are taking place within the context of this overall trend. Up to 2007, about 6 in 10 Americans favoured stricter gun laws. And, while this is down from the high of 67% in 2000, the overall direction of opinion clearly favoured more not less control. After 2007, Americans became more divided. 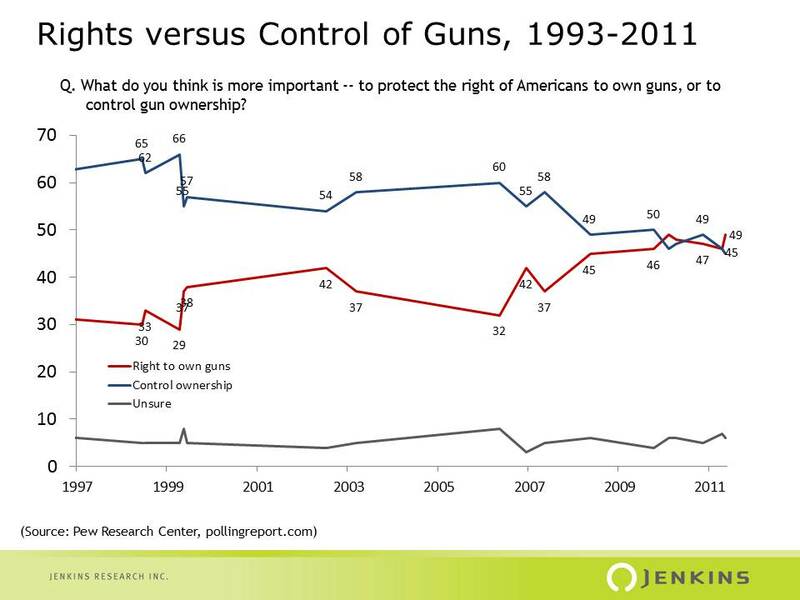 Similarly, when the Pew Research Centre asked whether it is more important to protect the right to own guns or to control gun ownership, opinion shifted quite dramatically after 2007. A majority in favour of control shifted to a virtual dead heat now. 2007 was a major turning point in American attitudes about gun control. This is neither consistent with a value-based explanation nor a simple link between the power of the NRA and the politics of guns. What spurred the post-2007 change? Unfortunately, the data trend does not allow us to narrow the shift with any precision. We know that the Virginia Tech Killings occurred on April 16, 2007 and that 2008 marked the election of Obama. Was the NRA particularly persuasive in the 2008 election? Perhaps because they feared t he democratic presidency? It is interesting to speculate that the fear of a democratic presidency spurned the opponents of gun control to be more active in their opposition. Unfortunately it is just speculation. Were gun control advocates less vocal or less persuasive? There is clearly a value-based explanation for some of the opposition to gun control. Freedom, particularly against tyranny (in this case government), are hallmarks of American culture. Of course, it is hard to see the changing opinions about gun control as simply value change since values are, by definition, very slow to change. Are these events no longer enough to stimulate action and mobilize gun control advocates either because they are common or because they have rarely produced results in the past? Have Americans changed their attitudes about the effectiveness of gun control? Are gun control advocates inherently disadvantaged when debating the merits against opponents who have a value-based foundation to their arguments? For now the prospect of policy change is virtually zero as gun control opponents have the clear momentum. 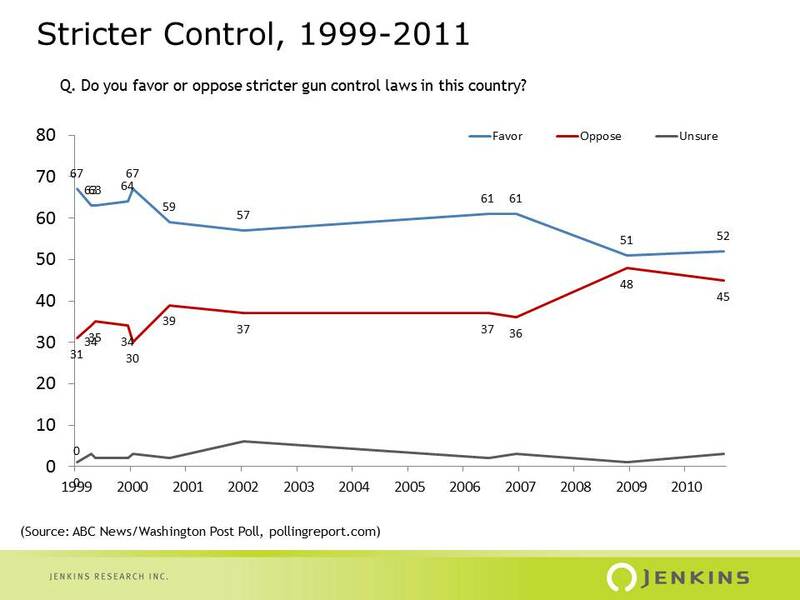 That said, America is divided and as recently as five years ago a majority was in favour of stricter gun control. Although the meaning of which is probably much less than outright bans on weapons (e.g. handguns), there are meaningful changes that could have been made when the balance of opinion is on-side. What do you think gun control advocates should do now? Wait for public opinion to be on their side, focus on educating the public about the facts of gun control, or, do a better job of explaining how gun control is consistent with American values?